… I am in the process of moving The Well-Appointed Desk to its own servers. It will probably be a little quiet around here through the weekend but hopefully by Monday everything will be back to normal. Make sure you update your bookmarks to http://www.wellappointeddesk.com. If you read the site via Tumblr, RSS or other service, please come back to the blog and make sure the links are properly updated. Sorry for the inconvenience but hopefully this transition will make for a better experience in the future. While on the road this week, we got to make another stop. This time, we got to visit the legendary Daly’s Pen Shop in Milwaukee, WI. Daly’s has been in business since 1924. The location has changed but its one of the oldest pen shops in the US. Its a lovely shop filled with all the lots of great stuff including a wide variety of pens, inks and paper. The owner Brad Bodart was friendly, helpful and patient with all my questions. The first thing I gravitated toward was this vintage Sheaffer case. The bottom row are mostly vintage Esterbrooks. The beautiful Parker Duofold on the right on the middle shelf is actually a reproduction with a ballpoint from the 70s. It explained the $35 price! Across the back wall of the shop was a fabulous vintage Parker Duofold clock with 1920s-style tortoiseshell celluloid frame and framed original trolley car advertisements. Sheaffer custom-built this glass and aluminum display case for Daly’s with grooves to hold pens and a secret cubby to store inks (Skrip, of course!). When the shop relocated over the years, this is one of the items that they always made sure was moved to the new location. They also moved a wooden case that runs the length of one wall full or narrow drawers to hold pens, ink and accessories. The Daly’s advertising calendar behind the cash register is fabulous and I was tickled that it hadn’t been changed since my birthday. Brad said that he always knocked it off the wall while trying to change out the date cards so he had stopped chainging it. He promised to leave it my birthday for awhile so if you go in, check and see if its still up. In the front corner of the store was a case full of vintage ink bottles. I love the labels! I particularly like the box of vintage Quink “reproduces best for V-Mail” box. Amazing. The billboard was actually a framed photo but I like to pretend that we passed it on our way in to Milwaukee. Of course, now most of Daly’s business in online. I got a peek in the backroom with shelves of pens and accessories for their massive online shop. If you didn’t see it, there was an audio interview with Daly’s Pens on NPR in November 2013. Its worth a listen. Thanks, Daly’s Pen Shop! We’ll be back to visit soon! Yesterday, Bryan at Field Notes/Coudal Partners kindly toured us around the world headquarters (AKA their offices in Chicago). We had great time and got to take a peek at the inner workings of Field Notes. It was an all-access pass and I am so thankful that Bryan took time out of his busy schedule to humor me. Bryan greeted us at the door, ready to show off all the fabulousness that is Coudal and Field Notes. Behind the door, was the front desk and sales counter for walk-in customers and pick-up orders. Its a really pretty work space. Bob peruses some of the leather covers available from Field Notes while I just ogle. We got to see some of the uncut press sheets from the Arts & Sciences edition. It’s so good to see how much attention to detail they take to get the Field Notes Colors Editions just right. In the stockroom are piles and piles of the County Fair editions which are some of my favorites. I have sets from every state I’ve lived in. In the shipping area are bins filled with individual County Fair books for the Road Trip kit. The packing area is efficient and well-organized and the team was busy packing up orders. Bins filled with the Arts & Sciences edition buttons sat prominently on the counter in Well-Appointed Desk-approved green bins. Totally industrial looking stenciled boxed lined the walls. I had a great time and Bryan was to ally patient with us. Thanks for a great tour! Expect to find a thank you note in THIS mailbox soon! Stephanie Fishwick posted some loose but lovely envelopes with her tips and techniques for creating fun envelopes for non-calligraphers. She recommends using watercolors but ink samples would also work and i a great way to use up all those samples you’ve accumulated. Her best tip is that imperfections make it more awesome. Use a limited color palette and repetition to pull it together. No one will complain if they got a hand lettered envelope in the mail ever. It will make their day. So, start playing. She recommends good quality envelopes like Original Crown Mill cotton or Crane. Big box office supply shops usually carry 100% cotton envelopes in the section with invitations and resume stationery. Maybe your kids will want to make some of their own envelopes too and send a letter to Grandma? That would be a fun, rainy day activity this summer. If you do want to improve your writing, Stephanie also has some recommendations for getting started with calligraphy and the tools, web sites and books she uses for great calligraphy. Most of all have fun and be inspired! How could you not love the clean graphic simplicity of the enamel jewelry created by City of Industry? I particularly like the Correspondence Set ($20) that includes both an enamel pencil and envelope lapel pin. The Ruler Enamel Necklace ($28) is also darling. It includes a gold plated 30″ chain. There are also some summer themed options as well. Enjoy! I’d like to welcome Pen Chalet as a new sponsor on The Well-Appointed Desk. Pen Chalet stocks fine pens from some of our favorite brands like Lamy, Kaweco, Pelikan, Namiki, Pilot and many more. Pen Chalet stocks inks, refills, notebooks, pen cases and more as well. 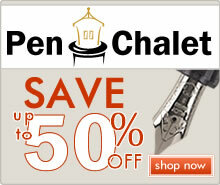 And to help sweeten the deal, Pen Chalet is offering an extra 10% off for Well-Appointed Desk readers. Enter the code wellappointeddesk at checkout will get 10% off their already reduced prices. Don’t forget to check out the sales page for super low prices. The special offers are available for a limited time only so if you see something you love, order it quick. And let Pen Chalet know you heard about them from the Well-Appointed Desk. Thanks to Pen Chalet for the great deals and sponsoring The Desk! 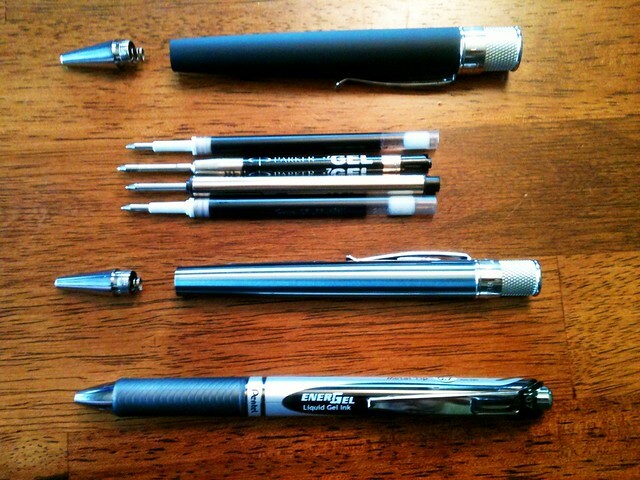 Since I got back into pens, I have become really enamored with Fountain Pens. I have been burning through notebooks trying to find good fits for FPs. I also started journalling – one for my daughter, one for my son, and one for me. I started off with the Piccadilly leather-something… and now I realize that if I keep going with this journalling, when I start vol. 2 I might not find a good match. Piccadilly seems to be erratic and in odd supplies. Are they going down for the count? Anyway – I want to find a good journal that is solid and will last a long time, as well as something archival AND in a format that is likely to be around over the years as I fill them up. Knowing that nothing forever, what’s a good bet? Although I don’t use Leuchtturm 1917, I thought maybe it would work well… many colors and solid paper. Other thoughts? Piccadilly does cater to the budget market like overstock shops so it can be hit-or-miss to find their on a regular basis. Their web site lists retailers who stock their products. Some people have mentioned issues with the binding over time with Piccadilly so I wouldn’t rely on it for archival journals and keepsakes. I use a Piccadilly for work notes which are not relevant by the end of the week so I don’t plan to pass mine down to future generations. If you are actually looking for multi-color pages, The Ciak Multicolor Journal might be to your taste. Fabriano used to make one too, for years, but I can’t seem to find anyone selling them now which is sad. They do make a version with an array of white, cream and kraft colored paper but not the rainbow of colors they used to make. Fabriano has made paper for centuries I think so they would be a good bet though I have not used the paper with fountain pens but it is designed for artists using pencil and pen so it might work well. You may be able to find some Fabriano sketchbooks in a local art supply store. Rhodia Webnotebooks might be a good option. Excellent paper for fountain pens, well-constructed hardbound books and Clairefontaine has been around for awhile and people love the Webnotebook line so they should be available for years to come. There aren’t a ton of cover colors, black and orange at present but their smaller Rhodiarama line have many different colored covers. I think the Leuchtturm1917 should be around for awhile, its good quality and reasonably priced. Its not super high end paper so some wider nibbed pens might bleed but it has the potential to be a book you’ll be able to find for years to come. They come is several sizes and configurations and have lots of cover color options, including a up-to-the-moment neon option at present. 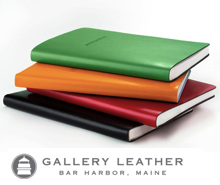 The classic black, artists sketchbooks from Stillman & Birn, Canson or Cachet might also fit your needs since they are all similar sizes and designed for artists so the paper quality is good (usually 65lb or higher) and reasonable priced (between $10-$15 for a 8.5×11″ size). 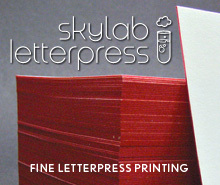 They are available in an A5 and a US Letter size no matter which brand you choose. Some offer a square or spiral bound option as well. And, to butcher a Henry Ford quote, you can have colored cover you want, as long as you want black. Any art supply store will carry one of these brands (or something comparable) so you’d always have access. I’d recommend the Stillman & Birn to start — the Alpha series paper is not too thick and excellent with fountain pens — though its not as widely available as the other more widely distributed brands. Most modern notebooks should have fairly low acidity paper, even if its not labelled “archival.” The artist-grade sketchbooks are definitely archival. I would recommend storing completed journals and notebooks in a dark, dry location (like an opaque plastic tub in a closet or attic) after its completed to protect it from light degradation or moisture which will could be a bigger threat than the archival-ness of the paper. After you’ve made your own Midori-style TRaveler’s Notebook, don’t forget to check out my previous post about customizing your notebook. For some reason, doing Ink Drop reviews seem to take forever. Maybe its because I have to dip and clean a pen five times. Then I get behind and have to dip and clean a pen TEN times. This time, I’m THREE months behind. So, hopefully, this was worth the wait. Blue skies, blue oceans, sunny days and sandy beaches are captured with the inks in the April Ink Drop. The R&K Helianthus was surprisingly usable for a yellow ink with more orange-y undertones. Private Reserve Shoreline gold was a warm orange-y brown. Both the Diamine Beau Blue and the Pilot Iroshizuku Ama-Iro are turquoise-y blues and the Diamine Coral is actually a blisteringly fluorescent pink-y orange. Its not so pinky as to be bubblegum, more of a vivid geranium blossom red/pink. This is a super fun assortment and was a perfect antidote to rainy, cold, snowy April. I love both shades of blue and will probably have to flip a coin to choose one or the other to buy as a full bottle. The Diamine Coral is also a favorite. It’s a bit more orange-y red than the Platinum Cyclamen Pink. J. Herbin’s Rose Cyclamen and Rose Tendresse are much more purple in comparison. Garden Party lived up to its name with an array of reddish colors: DeAtramentis Apple Blossom (scented), Pilot Iroshizuku Tsutsuji and Pelikan Violet. The PI Tsutsuji is a tiny bit brighter, cleaner color than Pelikan Edelstein Turmaline. The DeAtramentis Apple Blossom is not overpoweringly scented but it has a fragrance in the bottle that is not noticeable when dry. The color is sort of mulberry reddish purple. Its actually a lovely color and probably my favorite in the bunch this month. Private Reserve Buttercup is super bright yellow but not a fluorescent. It has a hint of orange to it but not as orange-y as the R&K Heliathus from the April Ink Drop. Platinum Leaf Green is part of the mix-free line and is a truly kelly green — like a beautiful spring lawn. Not my lawn, but someone’s. When the June Ink Drop arrived, I was a little bit of a doubter that the earthy tones of the Down to Earth theme would be appealing to me in the bright June sun but both of the browns were really appealing and the greens will be given a good deal more consideration than I initially thought. Private Reserve Ebony Brown is a deep clean brown on the reddish side of brown, warm like 70% cacao chocolate. It’s almost a warm brown black. If I were to buy a bottle of brown ink, this would be it. And the Platinum Mix-Free Earth Brown is a warm orange-y brown that is richer than Pelikan Brown. Diamine Salamander is an olive-y green black. It reminds me of the color of American currency — like the green on a dollar bill — feels historical. Noodler’s Sequoia Green has a true evergreen vibe, like pine needles. The Pelikan Edelstein Aventurine is a bit deeper green than the Platinum Leaf Green from the May Ink Drop but still a vivid kelly green, just a touch deeper, darker green with a tiny bit of a bluish cast. 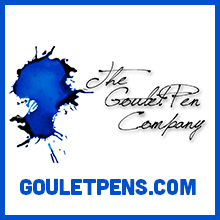 Ink Drop is a monthly ink sampling service from Goulet Pens. Subscriptions are $10 per month (add $5 for international subscription), pre-paid or ongoing, and include five different colors of ink and discounts on purchases of full bottles of ink in the Ink Drops. Swabs are done with a watercolor paint brush on Kyokuto Word Cards, writing samples are done on Rhodia No. 18 Uni-Blank pad using a soft bristle watercolor paint brush and a Pilot Prera with a Pilot Plumix 1.1mm Medium Calligraphy Nib.